While they are few and far between, there are some products that are “game changers.” This is one of them. 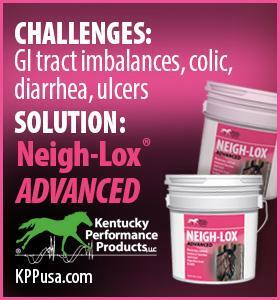 As a dressage rider and trainer I’m always on the look out for tack that will help my horses perform at their peak. (I’m also a certified tack addict which makes my quest that much more necessary.) While I’ve tried numerous types of saddles and various types of pads looking for whatever combination each of my horses seemed to work best in, I’ve never really spent too much time considering the type of girth I used. I suppose it’s because in my mind all the girth needed to do was fit and not chafe; I don’t think I ever really considered that it could enhance anything. That all recently changed with my young dressage horse. The Beastlet is a coming 5-year-old KWPN gelding. When set free to trot around or when lunged sans tack he floats in a ridiculously loose, springy sort of way. This was not, however, the case when he was tacked up and lunged. In fact when lunged with tack he looked sort of blah and a bit tight in the shoulders. Now The Beastlet isn’t an overly excitable fellow so some of his lack of extravagance could easily be blamed on his being unimpressed with the ‘silly circle game,’ but the tightness in the shoulders not so much. Since he never felt bad under saddle I initially chalked it up to him being green and not yet having the strength to really carry himself that way with a rider. Recently though, as he’s come along and developed more strength, the initial tightness started bugging me — especially since it wasn’t there when he was lunged without a saddle. After a minor stroke worrying that he was somehow “broken” (and multiple discussions with my vet who I’m sure thought I was nuts) I started analyzing everything about his tack, finally settling on the type of girth I was using and what my options were. Thus began the Great Girth Search of 2015, which I promise you was not as much fun as that snazzy title implies. After some trial and error and a string of various girths that made no difference or that he hated, I finally started to focus on how my saddle sat on my horse when it was girthed up. What I immediately noticed was that to put my saddle where the girth lined up in the girth groove (as I had been) meant that I had to set it pretty far forward. In that position it was literally sitting on his shoulder blades. Gee, I wonder why he looked tight? This was the moment I realized that I needed to invest in an anatomical girth. As fortune would have it, this was also right around the moment I got the awesome opportunity to try the Total Saddle Fit Shoulder Relief Girth. There are not many items that I would claim this about, but this girth really is a game changer. From the first time I used it I could see an immediate difference in his way of going on the line. Under saddle he felt more loose and infinitely more forward. The Beastlet has always been a little prone to being slightly behind my leg and starting out feeling a bit “stuck.” I always assumed that was just his personality but apparently I was wrong. After a month or so using the new girth he was starting out much more forward and quicker off my aids. He’s also been much more willing to lift through his withers (probably because I’m not sitting on his shoulders anymore) and really come through his back. I honestly feel like he and I are finally able to really start building his gaits and developing the necessary thrust from behind. The Beastlet and I warming up this last weekend. Even from this angle note the room behind his elbow to the girth. Photo (c) Michele Ting. After having such a great response to the girth with my youngster, I had to try it on my clients’ horses. I wasn’t initially convinced that I’d see the same substantial difference with horses with more average gaits but thought I’d give it a try. I was proven wrong within the first few minutes of each ride. Every horse moved more freely through the shoulder and seemed more willing to work back to front. One of my clients’ horses is an Arabian/Thoroughbred/Quarter Horse cross who is slightly downhill and built in such a way that every saddle and girth combination thus far has ended up on her neck by the end of the ride. She’s also inclined to be a bit behind the leg. With the TSF shoulder relief girth the saddle not only remained back off her withers, but she was noticeably more forward. This is my little Arabian cross mare. In the first image she’s in her regular girth and in the second she’s wearing the TSF girth. Notice how much more room she has behind her elbow with the TSF girth. The saddle is also able to sit further back with the TSF girth. Another client has a Friesian that has a tendency to be a little tight when asked to be supple and move his shoulders around. With Total Saddle Fit’s girth he’s much more supple as it allows the saddle to stay back where it belongs so he actually can move his shoulders. His lateral work and medium trot have improved significantly using this girth. My client using the TSF Shoulder Relief Girth. Note the saddle placement and the increased amount of room for the horse’s shoulders and elbows. 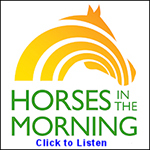 Yet another client rides both an APHA horse and a Friesian. She tried the Total Saddle Fit Shoulder Relief Girth on both of her guys with super results. Both horses immediately felt softer over their backs and freer with their front ends. While neither horse typically has an issue with saddles sliding forward, the Friesian is built in such a way that in order to put the girth in the girth groove you’d need to have the saddle almost on his neck. Once again the TSF girth alleviated this issue. With each horse I tried the Total Saddle Fit Shoulder Relief Girth on I became more convinced that pretty much every horse could benefit from it. In fact it now seems a little strange to me that previously I’d not considered what a significant effect the girth could have on a horse’s movement. Even horses that go well in regular girths seemed to go just a bit better with the extra shoulder room afforded by the TSF girth. In addition to the fact that horses seem to prefer it, here are a few other aspects worth noting that make the Total Saddle Fit Shoulder Relief Girth stand out. For starters the intelligent design allows for full range of motion for the shoulders and clearance for the elbows which keeps your horse comfortable and moving his best. This is why it makes such a difference. Another nice feature it that the TSF girth is well made and affordable! There are a few similar girths on the market but the TSF girth is by far the most economically priced at $124.95, which is a really nice thing if you’re looking to give it a try for the first time. In addition to that, Total Saddle Fit offers a 110% money back guarantee. That’s pretty hard to beat and makes giving this girth a go well worth it. Ultimately I feel like this is the sort of product that could really make a significant impact on equine performance and as such is certainly worth looking into. For more information on the girth, how it works, where to purchase it, and their money back guarantee, visit their webpage HERE. You should also check them out on Facebook! 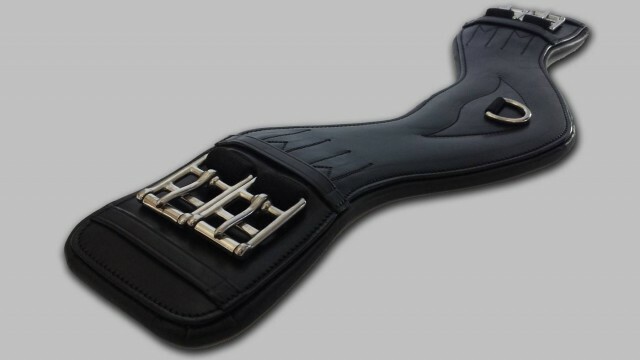 The Total Saddle Fit Shoulder Relief Girth. Note the unique shape. Photo (c) Total Saddle Fit. Go Riding! With a bit more freedom and elbow room!